Kelli Nina Perkins: Give Me Not Fame Nor Fortune...Make it Fabric! Give Me Not Fame Nor Fortune...Make it Fabric! Check this out! 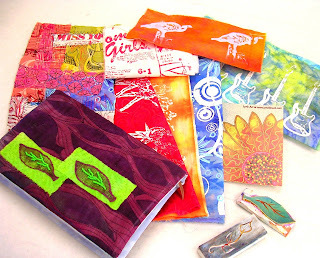 I got a fab stash of fabric goodies from Pokey's treasure, plus a beautiful hand-printed and stitched journal and some carved stamps from Lyric. These fabrics are all thermofax printed and they are AWESOME. Do I dare use them? They're so lovely! Kelli.......hello..........I just found your site........you do everything and you do it with such enthusiasm. I am so motivated by your work. Thank you for sharing yourself with the rest of us. You have a generous nature and a creative spirit.